– Connect with other sports-tracking devices like Garmin, Polar, Fitbit, Samsung Gear, etc. 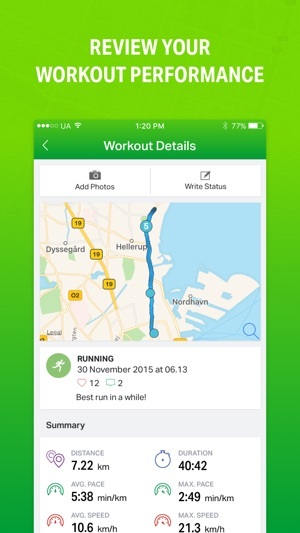 – Share results and workouts on your favorite social networks, e.g. Facebook, Instagram, Twitter, etc. 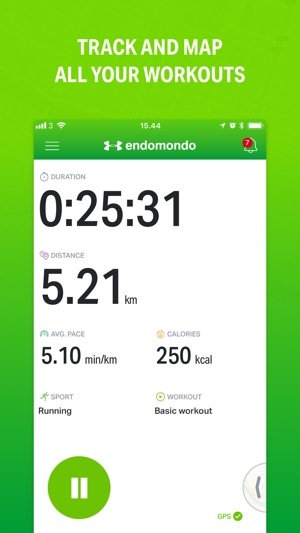 All your data is automatically synced with your Endomondo profile at www.endomondo.com where you can view and analyze all your workouts and manage your account. So, download the app now and start freeing your endorphins with us! When you upgrade to Premium, payment will be charged to your iTunes account at confirmation of purchase. You can choose between a monthly and a yearly subscription. For our best value offer, pick our yearly subscription – you won’t regret it! Meet your new workout screen! * Access all your workout settings with one click. Just hit the “Gear” icon in the top right corner. * No more accidentally stopping your workouts! Hold the “Stop” button to finish tracking. 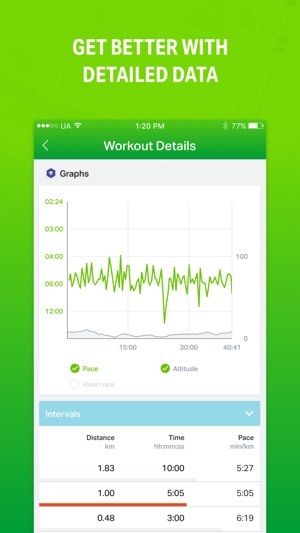 * View your workout stats and the map at the same time–no more swiping between the two views. * The improved GPS and HR monitor icons on the workout screen will help you ensure you're all set before hitting "Start" and allow you to keep an eye on them as you go. * Make it personal! Customize the stats you see by long-pressing the individual data fields. Want to see a larger map? No problem! Just slide the area with data fields up to expand the map area. * Apple Watch users, take your pace up a notch with interval training now available on your wrist! A fitness tracker designed for maximum motivation, Endomondo uses your iPhone’s GPS to precisely record distance, pace, and more as you exercise. The app links up with both Apple Watch and the Health app, and it connects you with friends so you can encourage each other. 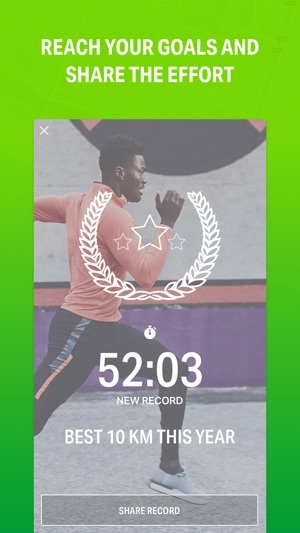 Plus, with a Premium subscription, you can set a running target—5K, 10K, or marathon—and Endomondo will coach you with a personal training plan. 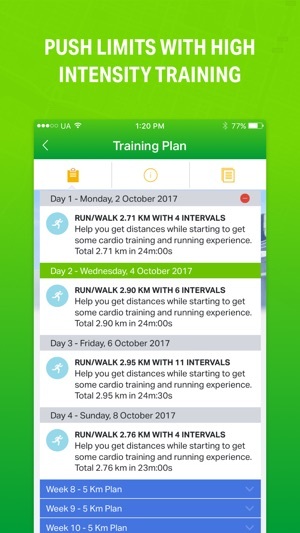 With support for more than 40 sports (not just the usual walking, running, and cycling), it’s a great app for all kinds of workouts. I finished running 1/2 hr ago. I can’t review today’s workout under history. I can click and see all the other previous workouts just fine (a winter hike in Jan, prev runs in fall). I can see today’s workout in the list but it grayish and nothing happens when I tap it. Workout was “ended”, because workout screen is waiting to start new workout. Glitch from last update? Btw, I’m using latest iPhone iOS. Thx! Took me while to figure out how to reset the stats display during workout since last app update too. Who want calories burned stat DURING workout? Heart rate is far more useful, important even, and should be one of the defaults. Would be nice to have some sort of warning/color indicator to for anaerobic status - nice to know after workout, safer to know during tho! Bonus to also know rest from productive (fatburn&aetobic) so u can kick it up a notch if want to reap some exercise benefit from a lighter activity. Otherwise, love love love app for years. Thx team for thoughtful design! Since the app update on Apple Watch, I have lost my workout data due to synchronizing issues For some reason, the Endomondo app loses GPS signal within a few minutes of the workout and once I “finish” the workout, it just disappears. I discovered it is going to the a section called “I unsynchronized workouts.” During my last two bike rides, a 45 mile ride lost data/signal about 9 miles in and nothing was tracked and data was saved in the app. Also, on a 50 mile ride, it lost signal within a few minutes of my house and still didn’t track data. What’s interesting the my Activity app within the iPhone shows that something was registering from Endomondo. I had distance, time, and calories burned. But it didn’t show mile Splits and additional data. Interesting that the app is tracking, but not displaying properly. Please fix!!! I would hate to lose over 5 years of workouts tracked. But I considering switching to another app.